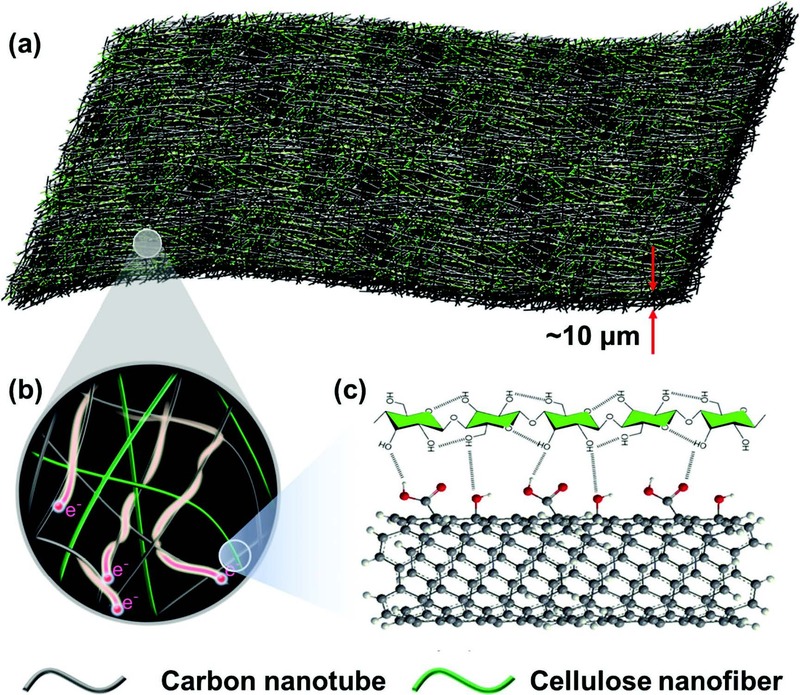 a) Schematic illustrations of the carbon nanotube (CNT)–cellulose nanofiber (CNF), all-fiber based current collectors, where b) CNT provides current pathway and CNF acts as backbone to enable the strength. c) Association exists between CNF and CNT, which enables the stability of CNT in CNF aqueous dispersion and the promising mechanical strength of CNT–CNF film. Much energy has been put into novel battery technology recently as scientists strive to find energy sources that are safe, efficient, low-cost, lightweight, and often, environmentally friendly. All-solid-state batteries, air-batteries, water-based (i.e. aqueous) batteries, and even batteries powered by organic materials, such as grass, are being developed. Very little energy, however, has been paid to the investigation of current collectors used, for example, in aqueous battery systems. “Current collectors used in today’s aqueous battery systems are usually metal-based materials, which are heavy, expensive, bulky and prone to corrosion after prolonged use,” the Materials Science and Engineering (MSE) resarch team - led by MSE Professors Liangbing Hu and Gary Rubloff – stated in their paper. Instead, the group focused on developing a thin film composed of carbon nanotubes and cellulose nanofibers, which has both high electronic conductivity and mechanical strength. “The carbon nanotubes provide current pathways – and high conductivity – while the cellulose nanofibers provide mechanical strength to the composite,” said John Hayden, an MSE undergraduate student and a first author on the corresponding research paper. “By blending these two materials, we can make lightweight films that have excellent electrical and mechanical properties, which could be beneficial in many energy applications." The team demonstrated the film's application as a current collector - the part of the battery that transfers electrons to and from an external circuit. High electrical conductivity is essential to allow for currents produced by a battery to pass. Current collectors must also have sufficient mechanical strength to preserve their structure in the battery. Not only is this material strong and lightweight, but it’s also resistant to corrosion. The group immersed the material in concentrated sulfuric acid for over four months, and yet, the films maintained their high conductivity. What’s more, the material is quite flexible, which could make it a strong match for wearable energy storage devices.